If you’re like most people, you’ll be wondering why dynamic warm-up exercises are important to do before a workout. Or perhaps you already know their importance and are simply looking for some great dynamic stretches to add into your warm-up routine. Dynamic stretching is a form of active movement that isn’t about holding a stretch but rather taking your body through ranges of motion that will better prepare you for your workout or sporting activity. Static stretching is the opposite. It’s where you hold a stretch for an extended period of time. A good warm-up should really focus on using dynamic stretches, not static. Why Is It Important to Warm-up Before Exercise? Unless you want to increase your risk of injury and reduce your performance, a good warm-up is critical. A good dynamic warm-up increases range of movement and blood and oxygen flow to your muscles, tendons, and ligaments before they’re called upon to do serious workout. When I worked as the strength coach for the men’s soccer team at the University of Toronto, I had the importance of dynamic warm-up exercises drilled in to our players’ heads. Every practice and game we had a solid 10 to 15-minute dynamic warm-up and it made a huge difference in preventing injuries and increasing their performance. I could go on and on, but I’m sure you get the point—a proper warm-up with dynamic stretching exercises is important. 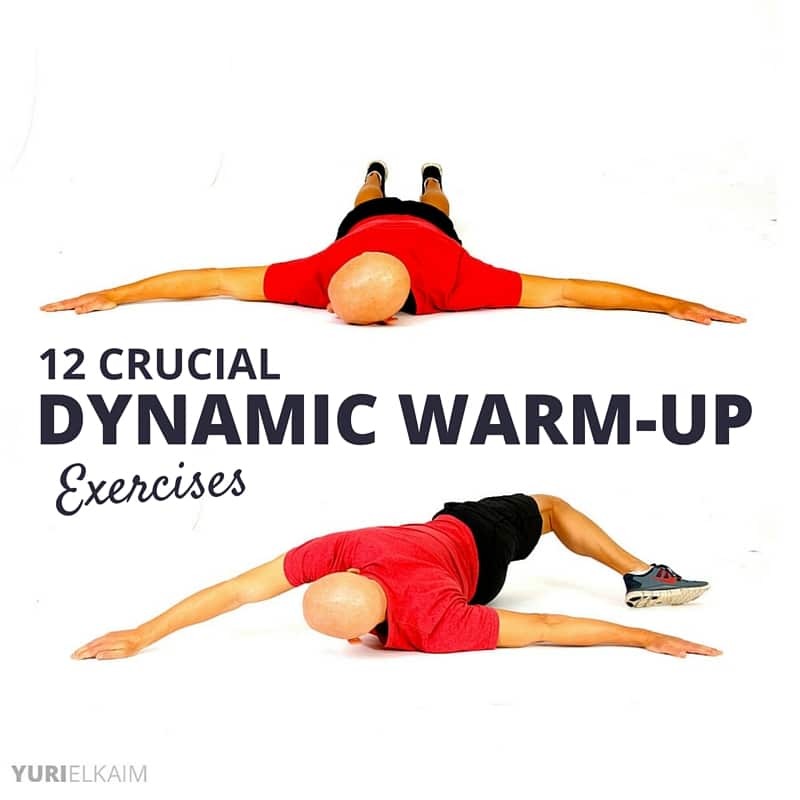 What Is a Good Dynamic Warm-up? How Long Should a Dynamic Warm-up Be? In general, you can complete a great dynamic warm-up in about 10 minutes—5 minutes for your light aerobic component and 5 minutes for the dynamic stretches. If you incorporate foam rolling I would add another 3-5 minutes (it’s totally worth it). Every workout needs to start with activity that will raise your core temperature and make your muscles more elastic for the coming workout. Doing some light jogging, biking, or anything else that increases your heart rate/temperature is what you need to start with. Otherwise, getting into your workout with cold muscles is like stretching an elastic band that you’ve just pulled out of the freezer. I’ll let you figure out what happens there. Your light aerobic/cardio warm-up can last 5-10 minutes and should be done at your “talk test pace”, which is a pace/intensity where you can hear your breathing but are still able to maintain a conversation. So, no “huffing and puffing” yet. When your body has chronic tightness, tension, or an area with a history of injury or overuse, adhesions usually form in the muscles, tendons, and ligaments. These adhesions can block circulation and cause pain, inflammation, and limited mobility. This is known as the cumulative injury cycle (or cumulative trauma disorder). It means that a repetitive effort such as sitting or lifting a weight causes certain muscles to tighten. But here’s the dilemma—a tight muscle tends to weaken and a weak muscle tends to tighten. This creates a vicious cycle. As a result of weak and tight tissues, internal forces arise. Friction, pressure, or tension can be present at the same time, which then reduces blood flow to the area. With less circulation, less oxygen comes to the tissue, causing fibrosis and adhesions to occur in the affected tissues. Eventually, a tear or injury occurs, and this restarts the adhesion process. That’s why lifting the groceries out of the car didn’t tweak your back. It was likely the years of sitting that created weak and tense tissues that were just waiting to snap. Stretching does nothing to alleviate this. However, deep-tissue work does. It is simply the act of physically breaking down these adhesions, usually by applying direct deep pressure or friction to the muscles. As these adhesions are broken down by deep-tissue work, blood flow and lymph flow to the affected area are enhanced. Instead of driving to a massage therapist several times per week, you can whip out your foam roller in the comfort of your own living room and work through your body’s tight spots while watching your favorite TV show. My foam roller is an integral part of our family. It has its own place in the corner of our living room. It’s almost ornamental. That way, it’s accessible and I see it regularly, which reminds me to use it every day. There are many types of foam rollers on the market, but I recommend getting one that is very firm. Avoid the cheap ones that are nothing more than glorified flotation noodles like you find in many swimming pools. You can also get a little more adventurous and use a RumbleRoller, which is essentially a foam roller with protruding extensions that dig deep into your muscles. They’re certainly quite uncomfortable—but highly effective. As effective as foam rolling and deep-tissue work are, I should warn you that deep-tissue massage (whether hands-on or via a foam roller) is not a comfortable, relaxing experience. The pressure and friction that deep-tissue work involves can be pretty intense. The best way to get through it is to breathe deeply and remind yourself that you’re doing your body a big favor. The tension will dissipate with just a few sessions, and with time you’ll feel so much better afterwards. You should also be prepared for the possibility of soreness after deep-tissue work, because as the pressure breaks up adhesions and introduces friction into an affected area, your tissues will probably get the same type of inflammation-related fluid accumulation you get when you lift weights. Again, this step is optional but HIGHLY recommended if you want to feel and perform at your best. Now that your body is warm, it’s time to work out the kinks, dust off the cobwebs, and get your muscles and joints used to the ranges of motions and movement patterns you’ll be encountering during the workout. At this stage, the goal isn’t to stretch, but rather to go through “dynamic stretching” movements that will progressively loosen your muscles and lubricate your joints. I’ve also thrown in a video to enjoy as well near the end of this post that will walk you through an entire dynamic warm-up sequence. Now, let’s look at the 12 best dynamic stretches I recommend you do before any of your workouts. Remember, these are to be done AFTER your light aerobic warm-up and your soft tissue work if you chose to do it. There are a lot of different things you can do in a dynamic warm-up, but I am going to take you through a number of exercises which I do on a daily basis before my workouts that are going to help you loosen up and help you feel more supple. This yoga staple is a great dynamic warm-up exercise for strengthening your upper body while opening up the back and front of your body. Go through 5 flows at a nice and easy tempo. These are a slight progression from the Vinyasa Flows and possibly my favorite dynamic exercise of all time. They target the entire backside of your body and open up a lot of muscles that get stiff with prolonged sitting. It’s actually a dynamic version of vinyasa flow yoga. Starting in a Downward Dog position on your hands and feet, walk your feet as far forward as possible while keeping your legs straight. Then, walk your hands out, extending your body into a pushup position and lower towards the floor, arching your back so that your head and shoulders reach to the sky. Then, flow back into Downward Dog. Walk your feet in again and repeat 5 times. This is the ultimate glute loosener. If you’ve got tight hips, this is exercise that will be uncomfortable and rewarding at the same time. In a push up position, bring your right knee toward your right hand while keeping your shin parallel to your hips so that your left foot comes just behind your left hand. Sink your hips towards the floor, feel the stretch, then return to push up position and repeat on the other leg. Go for 10 reps total. This is a great movement for opening up your hips and hamstrings. Hold on to a wall or fixed surface (or do this move without support for an added stability challenge). Swing one leg back and forth as if you’re kicking a soccer ball. Do about 10 swings on each side. You might get laughed at for looking like a dog peeing on a fire hydrant but you’ll be the one laughing when everyone is complaining that their hips and lower body are stiff and store. On all 4 fours, make sure your core is braced and nothing moves other than the working leg. Keeping your right leg bent at 90 degrees, take it out to the side and then in a circular motion. Do 5 circles in one direction, then the opposite. Then switch to the other leg. This is a great dynamic warm-up exercises for opening those tight glutes, hamstrings, and IT bands. Lying on your back with your arms outstretched in a “T” formation, bring your right leg across your body so that our toes meet your left hand. Return to start and repeat with left leg. Go for 10 reps total. This exercise is opposite of the Leg Crossover in that it’s the same movement but just done face down. 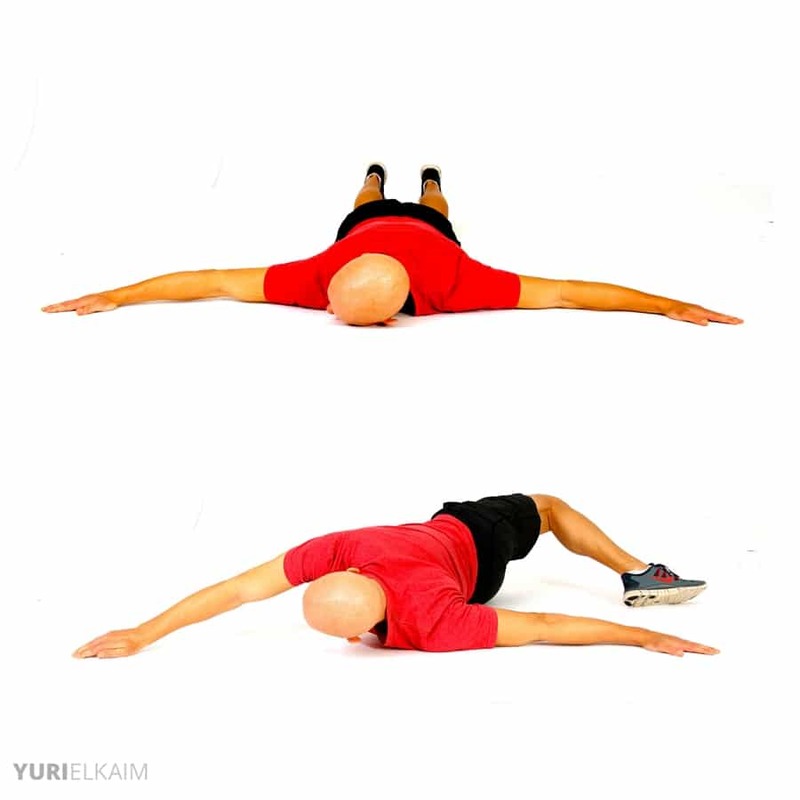 Here, in your “T” formation face toward the floor, roll your body to the left so that your right heel comes across your body to meet your left hand. Return and repeat to other side. Go for 10 reps and you’ll feel your obliques, hip flexors, and quads open up nicely. I have to credit to the German national soccer team for this one. A terrific dynamic stretch for opening up tight glutes and allowing better rotation through your thoracic spine. In a fetal position on your left side, keeping your knees stacked, open up your right arm so that it comes across your body and touches the floor to the right of your body (kind of like your body is a book that’s being opened up). Return to fetal position and repeat for 5 reps, then switch sides. This dynamic stretch is wonderful for opening up your hips and upper hamstrings. 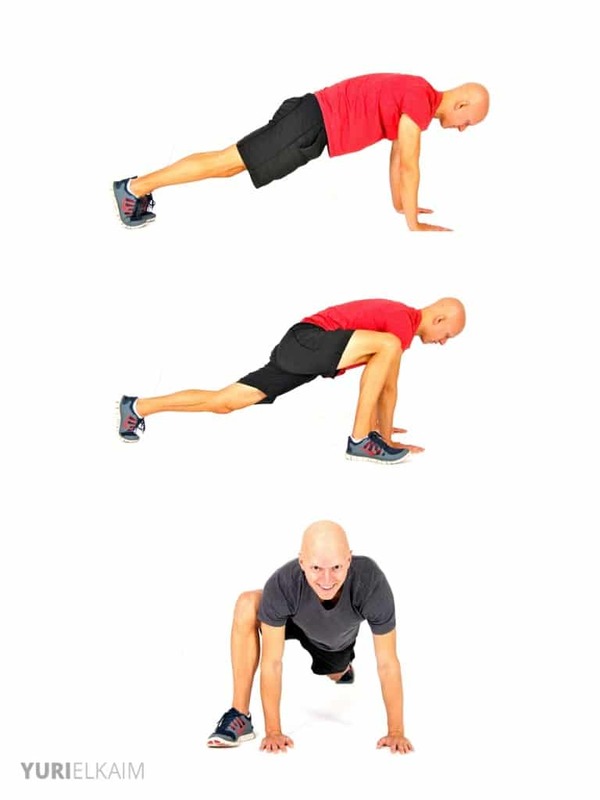 In a push-up position bring your right foot through to the outside of your right hand. Sit your hips down and feel the stretch, then return to starting position and repeat with your other leg. Go for 10 reps total. 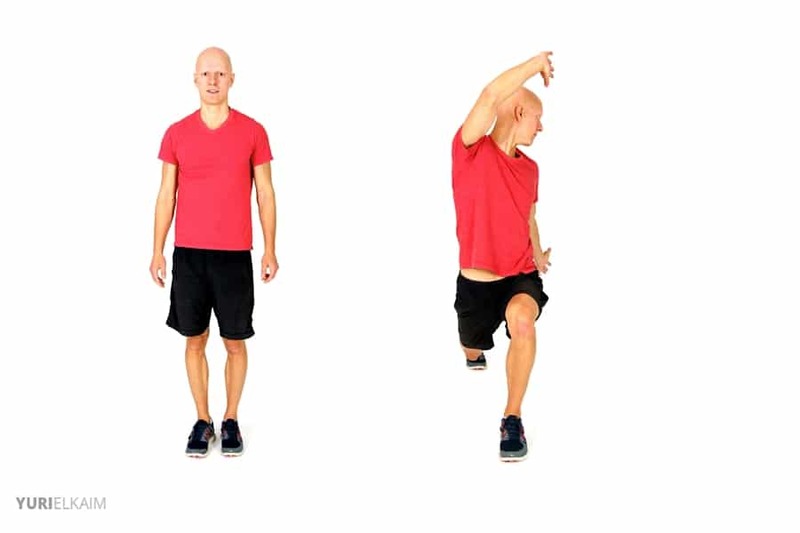 This exercise is a twisting progression from your Frog Walk-in. Begin in a push-up position and bring one foot in (as before), but now we are going to rotate the back foot so that it’s flat on the floor and then we are going to twist and open up to the side. This is a great dynamic exercise to continue targeting the muscles of hips through rotation. The twisting reverse lunge will help to open up your hip flexors and tight abdominal muscles, while also challenging your balance. From a standing position take a long step back with left foot, drop down into a lunge, and then twist and extend, over your right leg. 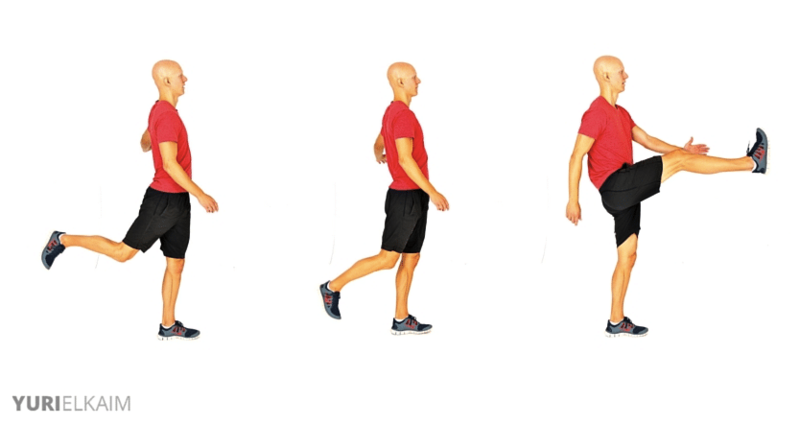 Then, return to standing and repeat with the other leg/side for a total of 10 reps.
Start off in a standing position and then drop into a forward lunge. From there, take your forearm, drop it to your instep so that you are now getting a lot of upper hamstring and groin action. Next, take your hand to other side of your foot and extend back so that your leg straightens. This targets more of the belly of the hamstring. Then, reverse this motion and come back to your original standing position or move through a series of lunge walks as you perform this lunge-to-straight leg sequence. Warm ups are really important – but workout recovery is just as key! Check out my 11 overlooked strategies to go from “sore” to “supple” in my FREE download, Workout Recovery Formula. Download it now by clicking the banner below.